Chemical Storage Regulations are always changing. Now especially with the New Executive Order that has been implemented by the White House. The Executive Order 13650: Improving Chemical Facility Safety and Security address the hazards that can occur from chemical storage. The Executive Order also provides a list of what needs to be done in order to provide a compliant and safe chemical storage environment in industrial applications and personal use. Chemical storage regulations are important for the environment, human health and your facility – keep your chemical storage safe and maintained. President Obama has also ordered federal agencies to review plant regulations, requirements, and storage capabilities regarding pesticide and fertilizer storage. Pesticide and fertilizer storage is widely used in many industries and must be stored properly in order to decrease or eliminate hazardous situations. Fertilizer storage is very similar to pesticide storage, where temperature extremes must be kept at a minimum, or less. Chemical storage regulations for fertilizer storage may vary by state and fertilizers that are being stored. Chemical storage regulations are very important to abide by, and if followed correctly can decrease the chance of expensive fines. The security of your fertilizer storage building is essential and must be kept locked at all times, when not in use. 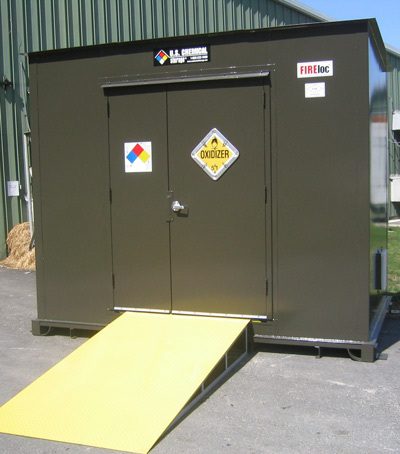 With US Chemical Storage, it is easy to follow chemical storage regulations. Fertilizer storage buildings from US Chemical Storage offer a safe and compliant way to store your fertilizer. Our fertilizer buildings offer a hand-welded, 12-gauge steel construction that is extremely strong and durable. Every fertilizer storage building is layered with a extremely durable, epoxy top coat for harsh weather resistance. Keep your fertilizer storage maintained by following all chemical storage regulations and compliant with a storage building from US Chemical Storage.